With summer nearly over, Sedgley Community Centre has a packed programme of events this autumn guaranteed to warm up those dark nights and keep everyone entertained. On Saturday, September 29, Ashmore Male Voice Choir will be hitting all the right notes and treating guests to an evening of all types of music and monologues. Tickets for this event, priced at £4, are available from Mary Lavender on 01902 885816 or on the door. And, as autumn moves into winter, what better than an evening of music and dancing to keep the cold at bay? The Sedgley Live event on Saturday, October 27, will feature a performance from Old Enough To Know Better, who will be getting everyone up on their feet with a selection of songs from the 60s, 70s and 80s. Also performing are Be bewitched, (bothered and bewildered) and a Frank Sinatra Cabaret. This event begins at 8pm and Sedgley residents will be able to dance their socks off until late in the evening. Tickets, priced at £3, are available from Lesley Whitehouse on 07971 739042 or on the door. Bring your own drinks and enjoy the fun! As the festive season draws near, get into the Christmas spirit with a concert from St Andrews Singers on Saturday, December 1, which starts at 2pm. Tickets for this event cost £3 and include refreshments. Sedgley Community Centre, based in Ladies Walk, is well known for hosting a series of events for local residents throughout the year, including the popular Flower and Vegetable Show, which celebrated its 18th year earlier this month. Other well-attended events include the Sedgley Live Arts and Crafts festival and the harvest festival. 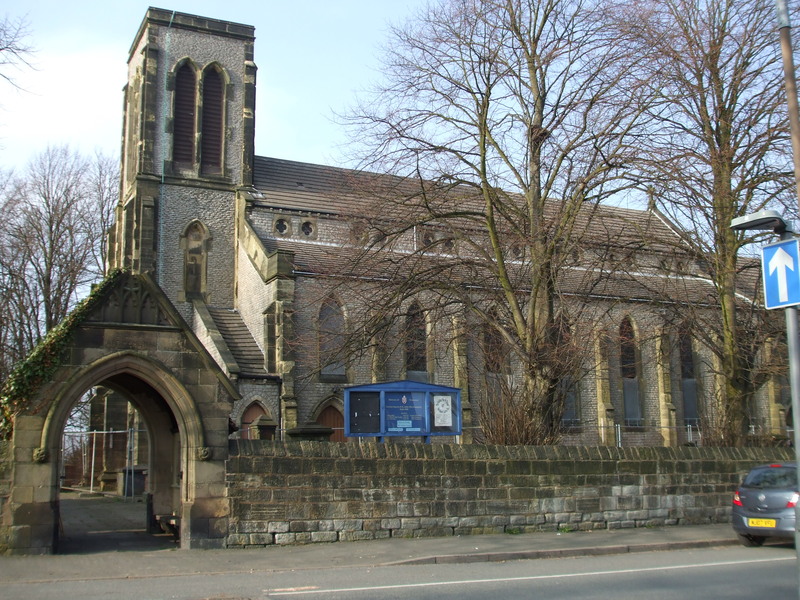 Sedgley residents can learn about the fascinating history of St John’s Church,Kates Hill, Dudley, as the new season of talks from Sedgley Local History Society gets underway. John’s Church Preservation Group and how their project to restore this 1840s building to its former glory depends on community support in order to succeed. St John’s Church is a hugely significant building in local history. Not only is it the burial place of William Perry, the famous Tipton Slasher, it’s also the last resting place of Julia Hanson, who is synonymous with Hanson’s beer and brewery. Marion Richardson, the famous art and handwriting teacher, is also buried there, and Reverend Edward Noot, who served at St John’s for 63 years until his death in 1905, was related to Edward Jenner, the famous physician who discovered vaccination and thereby helped eradicate smallpox in the UK. This Grade II listed building was closed in 2002 due to health and safety concerns but, since forming in 2007, the St John’s Preservation Group has worked hard to demonstrate how it can be fully restored and take its rightful place in the community once more. Numerous local celebrities have lent their support to the campaign, including former cycling champion Geoff Hill and Professor Carl Chinn – himself a descendent of the famous Tipton Slasher, William Perry. Sedgley residents are warmly invited to the talk, which costs £1 to attend. Annual membership of the Society costs £5 and gives free access to the programme of talks. Visit the St John’s Preservation Group’s website for more details on this important local landmark. Sedgley residents and visitors from across the UK can get ready for lift-off with the launch of the much-loved chairlift at Dudley Zoological Gardens this Friday, August 24. The official ceremony, which will be carried out by BBC Radio WM presenter Jenny Wilkes, follows a three-month £117,000 Heritage Lottery-funded refurbishment of the country’s only vintage chairlift. Work included a full refurbishment of the 41 chairs and roller system which carries the cable, plus an overhaul of the engine – a British-made DC which is electrically-driven with a reduction gearbox. The chairlift was last operated in 2002. Finance for the project is via a £1.2million bid for Heritage Lottery Funding, which will also see the restoration of four of the site’s 12 listed Modernist structures which form part of the world’s largest single collection of Tecton buildings designed by renowned architect Berthold Lubetkin. The chairlift at Dudley Zoo was the first passenger-carrying aerial ropeway to be installed in England. It transports visitors from the zoo’s lower zone to the 11th century Dudley Castle on the upper level within a two-minute journey offering panoramic views across Sandwell to Birmingham, before travelling directly over flamingos and rare breeds of sheep grazing on the banks. The chairlift opened to DZG’s visitors on May 11, 1958 and within six months had carried more than 154,000 passengers – approximately one third of persons visiting the zoo during that period. Visit the Dudley Zoo website for more information on the exciting refurbishment of this 1950s chairlift. Summer’s in bloom this weekend at Sedgley Community Centre, when green-fingered local residents will gather for this year’s Flower and Vegetable Show on Saturday, August 18. The event, organised by Sedgley Gardening Club, continues to grow in popularity and is now in its 19th year. It’s an ideal opportunity for local growers to display their potting prowess and show off some of their bumper crops. Members of the public are invited to come along to the Community Association Hall in Priory Lane and enjoy a packed programme of entertainment lined up for the day, including music from Wolverhampton Brass Band, plant stalls, cream teas, and a raffle and tombola with many prizes up for grabs. The free event takes place from 12 noon and is sponsored by Dudley Building Society. Later on in the year, Sedgley residents can enjoy the best in local produce at the Community Centre’s Harvest Festival and Ploughman’s Lunch which takes place on September 15. During this event, a short thanksgiving will be held at 11.30am followed by an auction of produce. The Ploughman’s lunch will commence at 12.30 pm. Tickets, priced at £3, are available on the door or by calling Mrs Evelyn York on 01902 661682. The concert by Ashmore Male Voice Choir on September 29 is sure to hit all the right notes this autumn and begins at 7.30 pm. Ticket price is £4 which includes tea/coffee. The evening starts at 8pm and tickets priced at £3 are available on the door or by calling Lesley Whitehouse on 07971 739042. Trainee keeper Lesley (then Brindley) at DZG camels section in 1989. They may be known as the ships of the desert, but closer to home in Dudley, one Sedgley zookeeper is making sure two young Bactrian camels are on the right course. 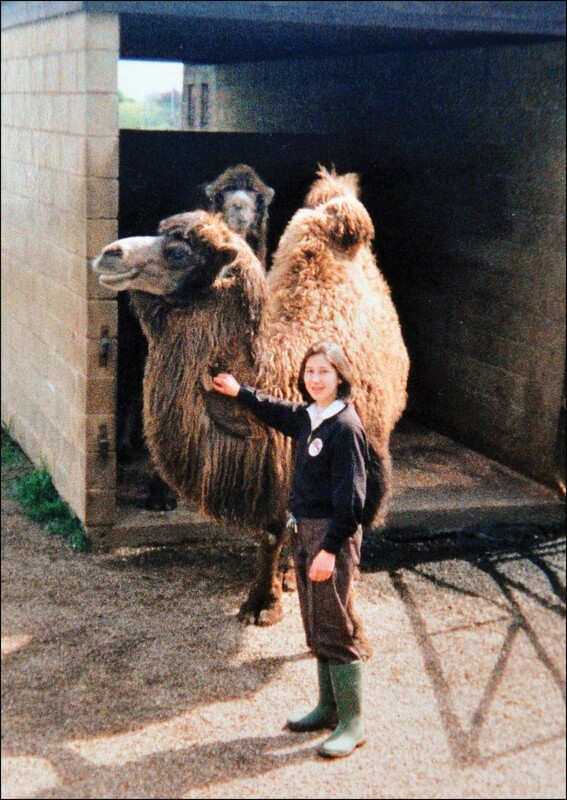 Dudley Zoo keeper, Lesley Lewis, 39, first worked with camels at the leading tourist attraction at the age of 16. She says: “Charlie and Jimandi are very big animals, and we need to be able to control them properly. “They are just two years old and I am training them to respond to hand signals, and rewarding them with a high five and their favourite treat of carrots. Bactrian camels (Camelus bactrianus) are large, even-toed ungulates native to the Gobi and Taklamakan deserts of Mongolia and Xinjiang with two fat-storing humps. 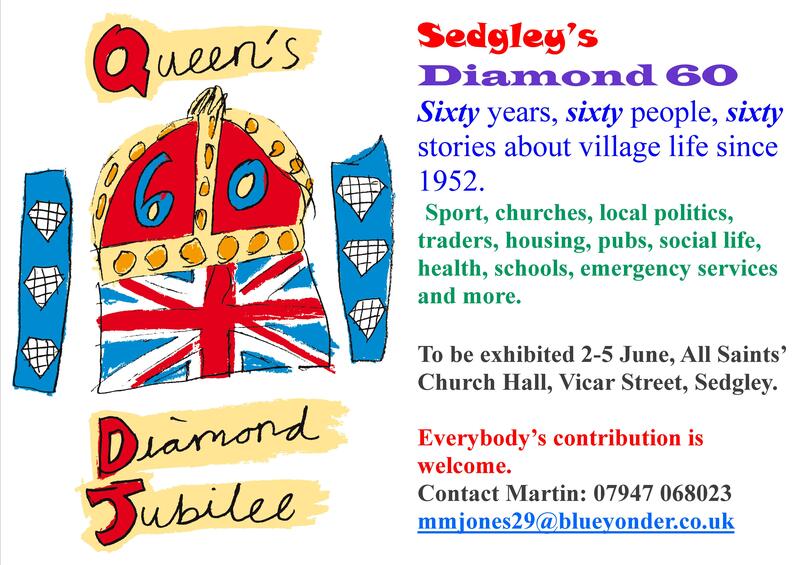 Sedgley residents are being invited to share their memories of the last 60 years as part of an exciting exhibition put together to commemorate the Queen’s Diamond Jubilee this year. The exhibition, called Sedgley’s Diamond 60, is the brainchild of local resident Martin Jones, who has helped the careers of numerous famous Black Country faces over the years, including music and movie star, Goldie. He says: “I’ve been interviewing Sedgley people for their memories of one day in the past 60 years of the Queen’s reign (i.e. Since 1952) that was especially important to them or to Sedgley itself. We have around 40 of the 60 stories we are looking for so far but still have plenty of gaps and some years are alas duplicated – so we’re still looking for contributions, particularly from the last 30 years. The finished stories will be presented to Sedgley Library and Dudley Archives and the exhibition itself will take place at All Saints’ Parish Hall from June 2-5, open from 11am -3pm daily. Email Martin at mmjones29@blueyonder.co.uk or call him on 07947 068023 to share your memories for Sedgley’s Diamond 60.